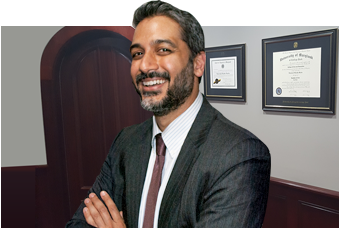 Hammad S. Matin is a criminal defense attorney with deep ties to the La Plata area. Born and raised in this community, he maintains an abiding commitment to serving its interests. In 2010, he was a candidate for States Attorney. He is the current Vice President of the La Plata, Maryland Lions Club and, since 2008, he has been a member of the Character Committee for the Maryland State Bar Association. In his work as a criminal lawyer, Mr. Matin has demonstrated exceptional dedication to aggressively defending the rights of his clients, both in and out of the courtroom. Mr. Matin founded his criminal law office near La Plata after earning valuable experience as a Judicial Law Clerk and as an Assistant States Attorney in Charles County. As the principal criminal attorney at the Law Office of Hammad S. Matin, P.A., Mr. Matin is honored to serve the needs of his clients in matters pertaining to criminal law, divorce and family law, juvenile law, traffic violations, expungement, and other areas.